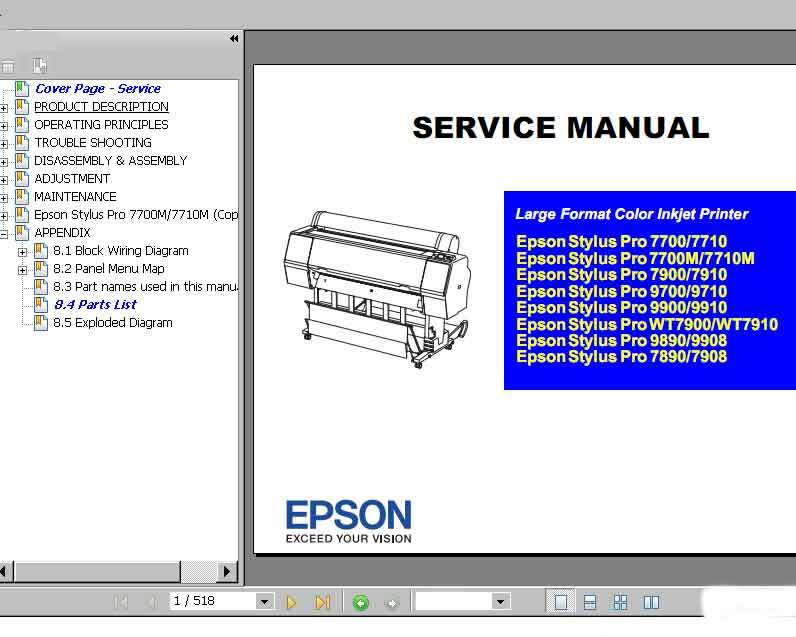 Home » Service Manual Catalog » EPSON Service Manuals » InkJet Printers » SM_pro7890 » Reviews I have paid for Reset Key but not received yet. My Epson 1400 got the end of life message and I had already ..
Epson Stylus Pro Pro 7700, 7710, 7890, 7900, 7910, 9700, 9710, 9900, 9910, WT7900, WT7910, 9890, 9908, 7890, 7908 printers Service Manual, Parts List, Block Wiring Diagram and Exploded Diagram New! My Epson 1400 got the end of life message and I had already reset it once before so I couldn't use the Epson site to reset it. I remembered this site from years ago and purchased the utility reset and it worked like a charm. Only wish I had not spent $400 on a new printer before remembering your site. Anyways I just did a live video showing that this really works on my youtube channel. More people need to know about this remedy! Notify me of updates to Epson Stylus Pro Pro 7700, 7710, 7890, 7900, 7910, 9700, 9710, 9900, 9910, WT7900, WT7910, 9890, 9908, 7890, 7908 printers Service Manual, Parts List, Block Wiring Diagram and Exploded Diagram New!